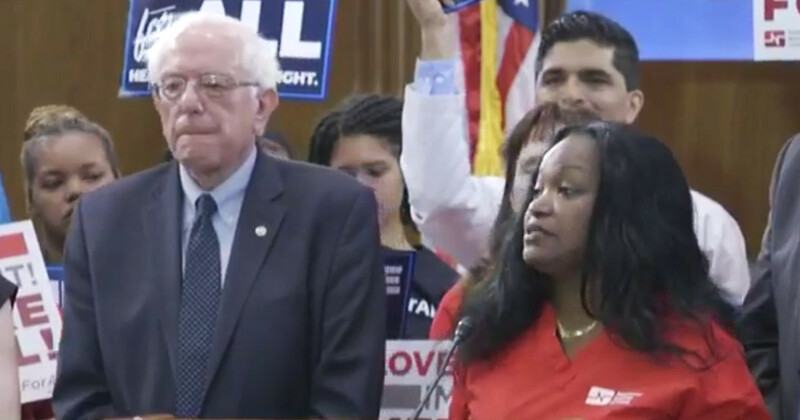 Cardiac care nurse and rank-and-file NNU member Renelsa Caudill explains why nurses fight for Medicare for All. Photo: Senator Sanders Facebook livestream. On Wednesday, April 10th, longtime UE ally Senator Bernie Sanders (I-VT) introduced the Medicare for All Act of 2019. The bill complements the Medicare for All Act of 2019 introduced by Representative Pramila Jayapal in the House of Representatives in February. “The American people want, and we are going to deliver, a Medicare for All, single-payer system,” said Sanders, echoing long-held UE policy. “This is a struggle for the heart and soul of who we are as American people,” Sanders said, pointing out that “this struggle will be opposed by some of the most powerful forces in the United States: the insurance companies, the drug companies, and everyone who profits off of the current system.” He noted that the top five health insurance companies raked in $20 billion in profits last year, and paid their CEOs $1.7 billion. I recently had a patient who had been unemployed for 9 months. He lost his health insurance when he lost his job. By the time he got a new job and had health insurance, his heart had begun to fail. This patient is experiencing new onset heart failure, that would have been prevented if he had gotten the care he needed. I had a patient who was prepped for a CT scan for serious heart problems. In the middle of the procedure, we received a call telling us that we did not have authorization because the insurance company would not pay for it. Sanders was also joined by Senators Kirsten Gillibrand (D-New York), Jeff Merkley (D-Oregon) and Richard Blumenthal (D-Connecticut); the president of the American Medical Student Association, Perry Tsai; and NNU President Deborah Burger. [U]nion workers and other everyday people should shape the policy that impacts their lives. Without working people at the table, policy becomes less about addressing what’s good for public health and safety, and more about appeasing corporate apologists who constantly champion “being realistic” over being safe, moral, or just. Explaining why NNU pushed Jayapal (and Sanders) to introduce the strongest possible Medicare for All legislation, Castillo points out that unions like NNU and UE never go into negotiations with “watered-down demands” — and that we must do the same in the political arena. Watch the full press conference on Senator Sanders’ Facebook page.